Synopsis: What happens when an Owl Moon rises? The everyday world veers into extremities – hot blood spurts and passions seep into a wintry landscape of cold and desolation. Two couples venture into a desolate, frozen snowfield for the night where they find themselves trapped, both physically and in the mire of their own neurosis. Lisa is determined to win back her ex, Isaac, and will stop at nothing to do so. 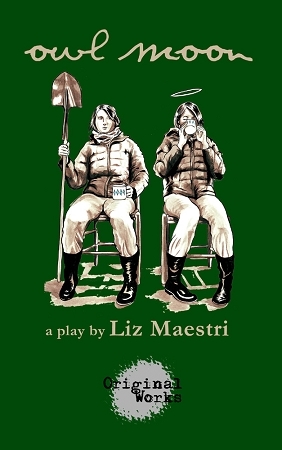 Shell and Salome carry weighty sacks across the snow, looking for a way to purge their sins. The play follows this group of characters through conflicts and collisions that stretch taut conventions of style and tone. Is it possible to lose oneself? To lose oneself in another? Owl Moon examines the fine line between passion and obsession, and the toll it takes on the mind and spirit. Add in a talking owl, and you have a play that juggles the heady, humorous and harrowing in equal measure.